Welcome to Week 5 of Punt Pass Play. Another week, another victory for my article writing. Calvin Ridley basically made it a push with 2 TDs, but he’s still third on the Falcons in targets behind Julio and Sanu. Boyd did exactly what I said he would do: Receive targets, receptions and vast opportunity. Sammy Watkins did Sammy Watkins things: get injured. All in all, we can say I’m 4-0 or 3-0-1 year to date. Today we are visiting the old vets playing bingo at the assisted living facility. While it may seem that way, Week 5’s series of Punt Pass and Play involves some well-known veteran players: Marshawn Lynch, Adrian Peterson and Mark Ingram. I’m aware Mark Ingram finished as a top 6 back last season. 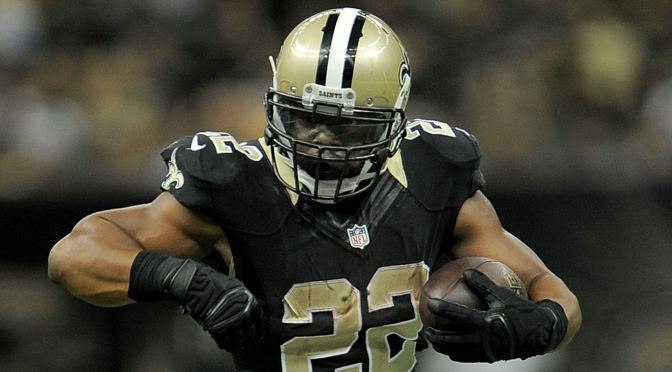 I’m also aware that Mark Ingram had his best season as a pro last year. However, Alvin Kamara has shown he can be a workhorse back. For some reason, Ingram has never been Sean Payton’s favorite player. Next, he’s coming off of a four game suspension. So, we aren’t entirely sure that Mark Ingram even gets a hefty workload to start his season out. Last, the Redskins currently have the 3rd best defense in the NFL and have given up the 3rd least rushing yards in 2018. Personally, I think you can sell him while his value is at it’s highest. Get a solid ROI and move him while people think he can be a top-tier guy. At best, I see him as an RB3 who will see 10-13 touches this game. There’s not much else to say here other than he’s been a top 9 guy the previous three years, those are words you can use in negotiations to make a trade. This is a game to own Brees and Kamara. Ingram is aging. He’s not out of his productive years yet, but he’s turning 29 this December. He will be a free agent next year and I would wager that Sean Payton will let him walk. Where does he end up? Will he be productive in a new system and potentially less powerful offense? There’s way too many unknowns outside of Alvin Kamara being the new sheriff in town. Move your Ingram stocks for your rookie picks and upcoming risers now. Next year will be questionable at best, and I think we see him slip more into a rich man’s Alfred Morris / C.J. Anderson role. I think we should give AP and Frank Gore an Iron Man WWE Belt for lasting so long and being so tough up to this point. But that doesn’t necessarily mean consistent fantasy production. Yes, the Saints defense went back to being more disappointing than my student loan balance. However, game script will force Washington to play catch up–thus contradicting my point about Ingram above. 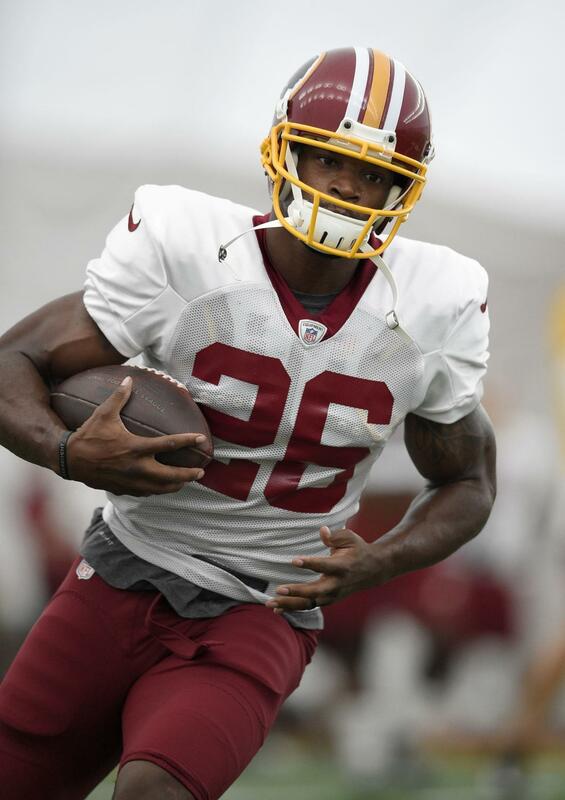 But this game will have a lot of passes thrown, which will benefit Chris Thompson more than AP. I definitely like the idea of using AP for a Bye week slot in, but there may be better matchups to use over this one. As a Chris Thompson owner, I’m a fan of the matchup more because New Orleans is allowing 390 passing yards per game this season but are stout against the run, sitting at 4th in yards allowed (just under 80/game). Part of that is, again, due to them enforcing a passing game script. He’s definitely worth keeping this season for solid matchups, but pass on him this week if you can find a good replacement. You don’t need to be a Brainiac to know that AP is essentially a one year rental until Derrius Guice returns next season. Barring a setback in his recovery, AP will likely be relegated to short yardage situations or may even be cut. If you are a losing team, trade him to a winning team for as good of a pick as you can get in 2019, but no lower than a 3rd, especially if a team has a flex spot to fill so they can win their dynasty league this year. For example: I was able to add Julian Edelman for a 2020 2nd rounder into a deal because a team owner had a gap at wide receiver and they are winning this year (even though my team is stacked too, so I could afford to move him). You can likely pull off a deal in similar fashion. Try for it. If you are in a spot to win, I would make use of this one year rental. I’m placing him here so I won’t get fined (see what I did there?). Beast Mode is back. I doubled down on him in a fresh dynasty league and traded for him during the preseason. His numbers were too hard to ignore toward the end of the 2017 season. Add in a Jon Gruden style Revolutionary War Era offense? I’m sold. Lynch is a top-8 (PPR) running back as it stands and is fourth in the league in rushing yards. Bartender? 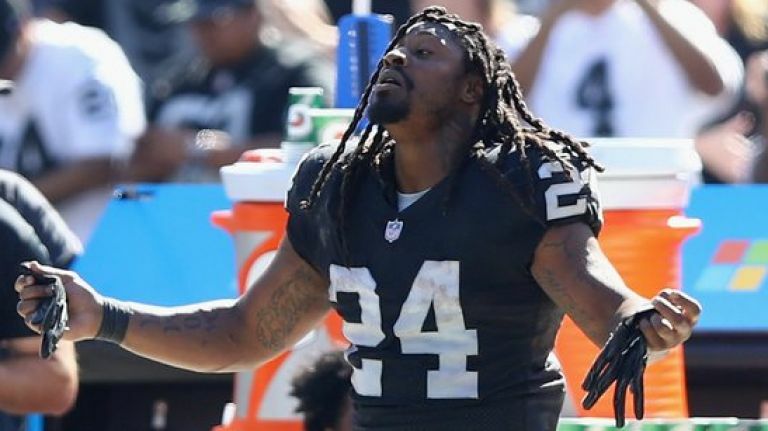 Give me a shot of Beast Mode even against the Chargers. Based on volume alone (19.5 touches per game average), he should be able to produce solid flex numbers with a high-end RB2 ceiling. Marshawn Lynch, like Adrian Peterson, will be another solid one year, win now player. I truly loved what I saw in Chris Warren during the preseason prior to him going down. This RB situation may be one to avoid after this season. If they bring Lynch back one more year, I can see him being a top-18 back while splitting duties with Warren (and maybe Richard as a change of pace). But until then, we are unsure if he re-signs or retires. One thing Lynch has is the old school “I’m having fun like an 8th grader” mentality when it comes to football. Being the hometown guy, the Raiders will feel obligated to ride him out this year and get their money’s worth as no other remaining back shows viability in the run game, including everyone’s favorite Muscle Hamster Doug Martin. The value will be low for Lynch, and for him being consistent in a top-8 spot, he’s worth riding into possible retirement if you can win this year. Otherwise, sell him relatively high to a win-now team who needs to slot in a starting spot. You can easily score a 2nd rounder for a top-8 guy as it stands and maybe bundle yourself into a 1st if negotiated properly. In summary, Mark Ingram continues to fly under my radar as he’s done for so many other fantasy owners. He’s been productive, but the situation and opportunity will lessen for him. AP is no longer matchup proof–sit him in a passing game shootout. Lynch is the main guy for the offense. Let him carry you to victory, or let me mock you for ignoring me again. For more fantasy advice, add me on Twitter (@ricco_3733) or ask via email at Riccadonna3733@hotmail.com. Until then, I’ll see you for the Week 6 edition of Punt Pass Play!